It is unusual considering the age of these drums that certain components are made with more consideration for frugality than quality. I remember when I last saw these drums that I had a number of difficulties with the fork pressing (Premier’s name for the part), which is the lever that lifts the sleeve which disengages the clutch from the underside. Well seven years have gone by since then, and the drums have been giving good service, but recently these components have started to fail and cause problems, so I have the drums again to come up with a solution. What is evident from the video is that the choice of how Adams made these components is dubious. As I mentioned in the video, the British Isles leads the world in engineering, always has and if the government get their head out of their arses it always will. So of course Premier made the parts the proper way which is why 50 years later the design has not changed. Adams are copyists but seemingly things have always been done on the cheap. Short term gain. The lack of engineering knowledge to come up with a good design is one thing, but the worst element of these components is that they are badly made. This causes lots of problems when I come to copy them, because unlike them, I make things square/perpendicular/paralell/etc as appropriate. Therefore the job immediately becomes a lot more challenging. I have timpani 29 “copper portable. The conecting part between the cattle and the base broke. How can I get a part. Please can you email me a photo of the broken part because I don’t know what you are referring to. Then I will be able to look at some solutions. 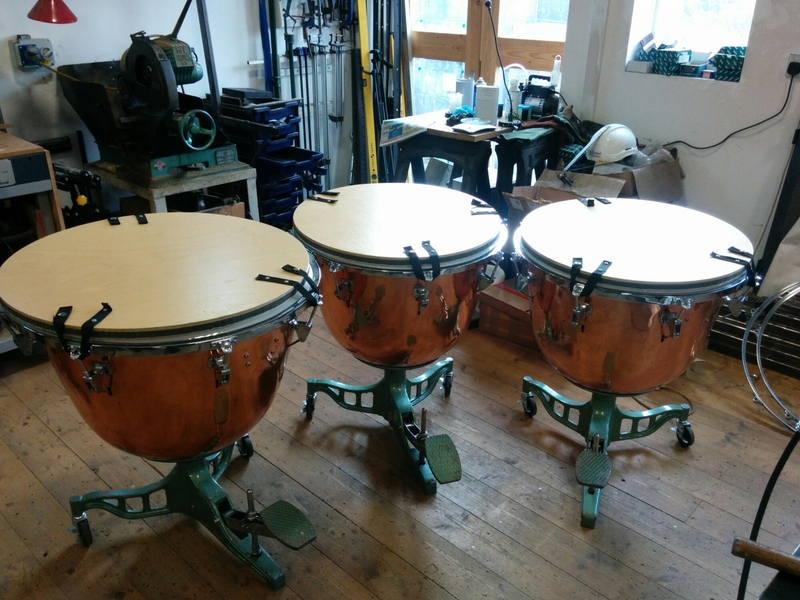 My orchestra is the proud owner of these three Adams timpanis and we are delighted with your skilful re-making of the fork pressings. Your videoed master class describing how you tackled and solved what seemed to us to be intractable problems makes for fascinating viewing. Thank you for your superb service! Thank you very much Harvey. It always nice to hear from satisfied customers. 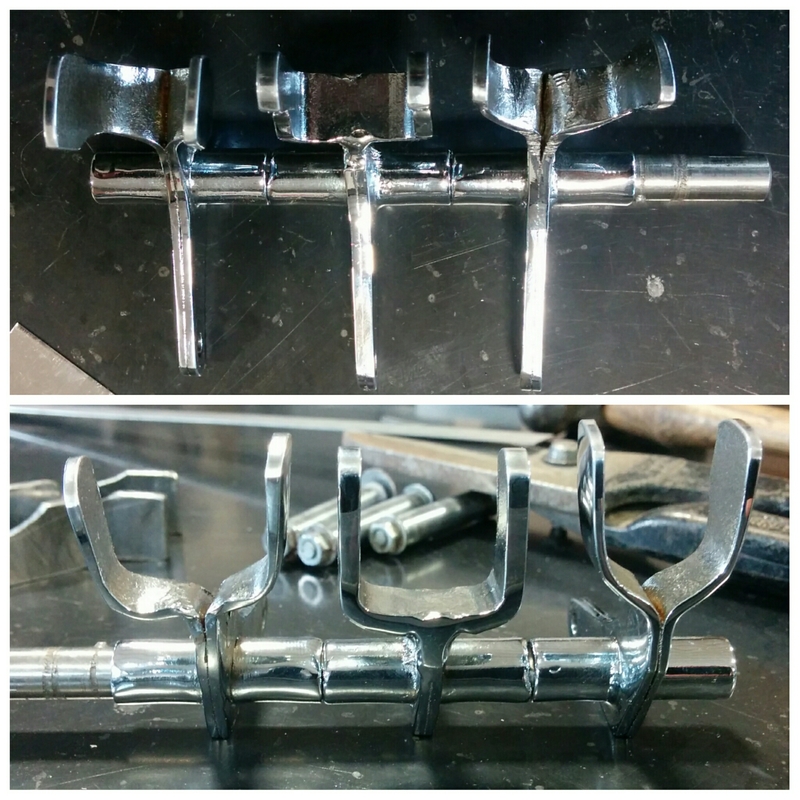 I am only sorry that I could not create the second installment of the post showing the completed parts in operation.